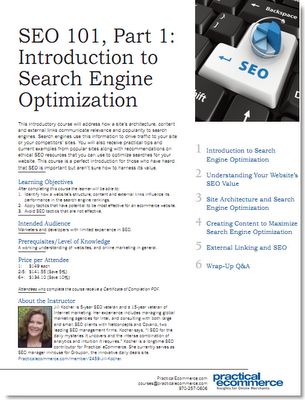 Running a successful online business is no walk in the park, and sometimes it feels like you just don’t have the time you need to keep on top of everything that’s going on, from social media to search engine optimization. Reading books is too time consuming, and hiring consultants to train you might be out of budget. Practical eCommerce – which over the years has become a reliable point of reference for small- and medium-sized online merchants – just launched an interesting new offering that might help. 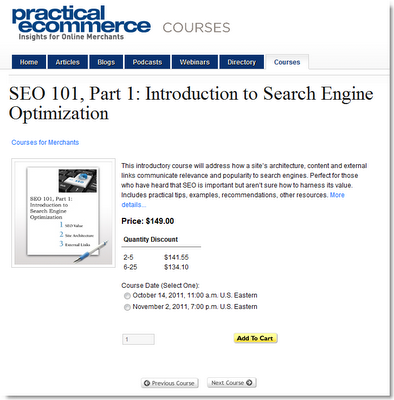 For a relatively small amount of money ($149 per course), they are offering 2-hour long, instructor-led online courses on many ecommerce-related topics. Considering that the cost is less than what you would pay a consultant for a couple of hours of training, it might be money well spent if it can help you improve important skills that are relevant to the success of your business. Click here for a list of classes, and – if you end up taking any of them – let us know how it went. 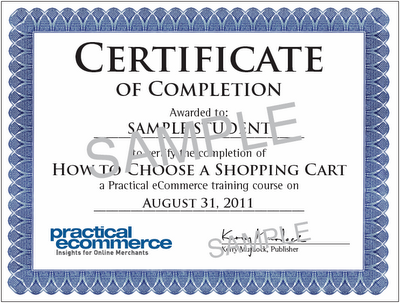 BTW: if the shopping cart looks familiar, that’s because months ago the folks at Practical eCommerce selected ProductCart to build a custom store to sell online classes. Some of the features were customized by long-time Certified ProductCart Developer NetProfits to meet their special needs. Adobe Connect was chosen as the e-learning platform.